Supporting great overall health, these tasty dog biscuits are tasty and healthy treats to feed any breed of puppy during the development stages. Containing no added flavours of colours, there is a lower risk of intolerance. 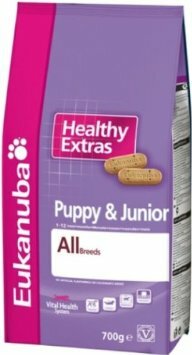 Eukanuba dog treats support the main 6 areas of development and functions. With 28% protein and 15% oils, your dog will benefit from maintained teeth, bones, muscles and skin, fur. Feed your puppy between 2 to 4 of these tasty treats per day for best results.